First bib picture at the Health Expo! I've got to tell you, participating in the Inaugural Star Wars Marathon Weekend was absolutely amazing. I ran my FIRST ever 10K race, which also happens to be the longest distance race I've ever participated in. 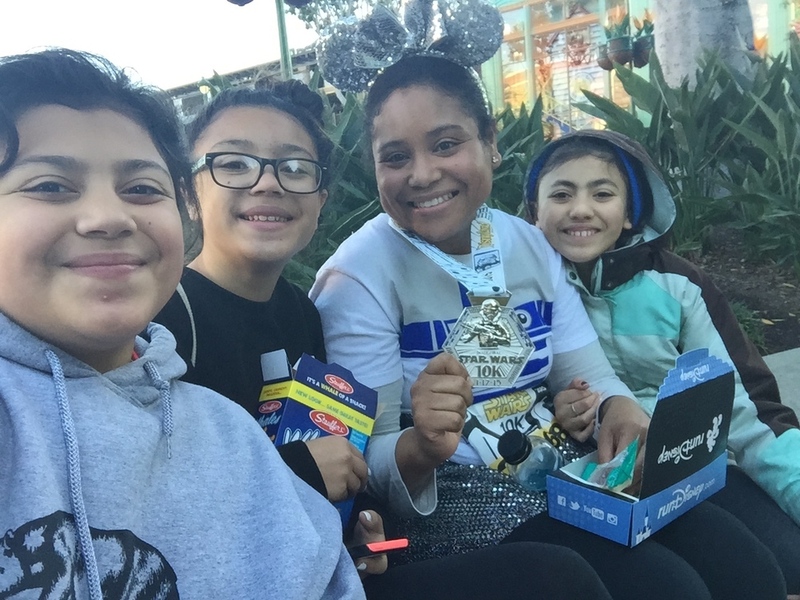 Not only that, this was my first runDisney event and I was embarking on this adventure by my lonesome, but gratefully my mom and 3 daughters there to chEAR me on at the finish line! Just to give you an idea of the process, I thought I'd share my experience as a newbie. Running is nothing new to me, I was a track and field athlete since I was around five years old competing for over 10 years until injury my junior year. The biggest change now (besides my body being totally different after five kids) is that I am running distance, as opposed to sprints. I had no endurance in high school and I just wanted to go fast. Now I am all about pacing myself and just enjoying the course. I love running. Sometimes I dread physically getting ready for a run, for whatever reason (usually because it's freezing cold in the morning), but I truly love it. It's a great stress reliever and it makes me happy. I'm pretty sure my old HS track coaches would be proud, because I haven't run this far (at one time) in my life! I jumped at the chance to be part of this epic moment in runDisney history, as the magic and the force collided for the first time. Since this would be my entrance into running "in costume," I opted for something simple, yet fun. 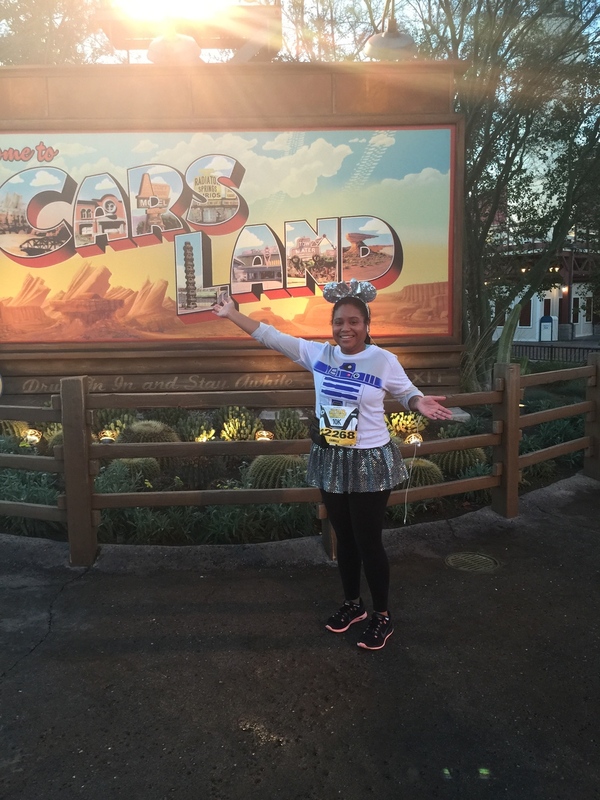 I did not want to just run in a dri-fit shirt and pants, so I added some sparkle and picked up an R2D2 shirt. I know that next race I will not be wearing any cotton, it wasn't uncomfortable, but it wasn't comfortable either. Thankfully I did not end up with blisters or weird rashes. I mean, it was just a 10K but still. I probably should have read more about race gear prior to running, not after. Ha! When the Force and Magic collide. R2D2 Mickey. I saw a few of my awesome blogging buddies prior to the race, they graciously gave me a heads up on the race itself and where I needed to be. Happily, I ran into another friend, Jen from Real Mom of SFV, and we both were placed in Corral D, so we got to chat before the big race began. I'm so grateful that we found each other! I wasn't quite sure what to expect, and it's always extra magical to have a friend! Thanks, Jen! I don't have anything to compare this experience to, but I can say that I had so much fun!! We ran behind the scenes of both Disneyland Park and Disney California Adventure, which was awesome! Starting the race in the morning was a bit chilly, but it was motivating to just keep going. I kept a decent pace throughout and took some pictures along the way. If you know me personally, you probably can imagine that I literally cried as I ran up Main Street U.S.A., towards Sleeping Beauty Castle. I seriously couldn't help it. I was overwhelmed with excitement and joy. I was so happy to finally be part of the runDisney experience (Side note: After getting really sick in 2012, I lost my registration fees and couldn't run the Disneyland 1/2. Since then, I've been eager to lace up and be part of a race). So grateful that I was able to secure registration for this great weekend!! I cannot wait to do another! Here are my newbie tips! Research race gear prior to the race! Don't wear new shoes day of, break them in. TRAIN TRAIN TRAIN! It really should be obvious (and probably #1 on the list, but let's be honest, costumes are important). If you have never run before, heed the warning and train well. Don't put it off because your legs and body will pay for it... days later. Get your body ready through your diet - there are so many places to get info on proper fuel, but check with your doctor and make sure you're eating enough calories as you train and try to stay away from excess sugar! During the race, there are photographers (And characters) everywhere! Smile or don't, but know you're being captured! :) You can also stand in line to meet characters. Remember you're usually running at the crack of dawn or before, so give your family a heads up. They'll need to dress accordingly! Make a plan for a meeting place after the race with your family and friends. It's really chaotic and if your family is unfamiliar with the Parks, this is a must. Review the race booklet given to you at bib check in, it's a great resource and answers seriously ever question! I'm so excited to share my images (above - it is NOT easy to run and snap a photo, after my first attempt on Main Street U.S.A., I did not attempt it again) and the starting video (below)! Enjoy! Did I mention that I met and chatted with the fabulous Leslie Kay, the creator of DisneyBound? I noticed her walking in front of me, it was her sweet tattoos and the awesome new Lost Boys plaid shirt she was wearing that prompted me to call out to her! She's super sweet and if you haven't already check out DisneyBound and GetFitWith Disney on Tumblr. So much inspiration and fun!! 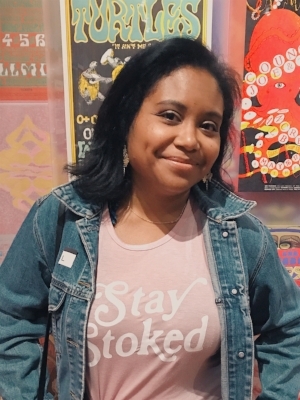 Leslie teams up with Disney often sharing her creative vision! Also, in another image I am with Jordan Poblete, Editor in Chief of DisneyExaminer! If you recall, I am their official Mommy Blogger and it's always nice to catch up and see my friends in real life! Kudos to Jordan and the DE team that finished the Star Wars Half!! How about you? 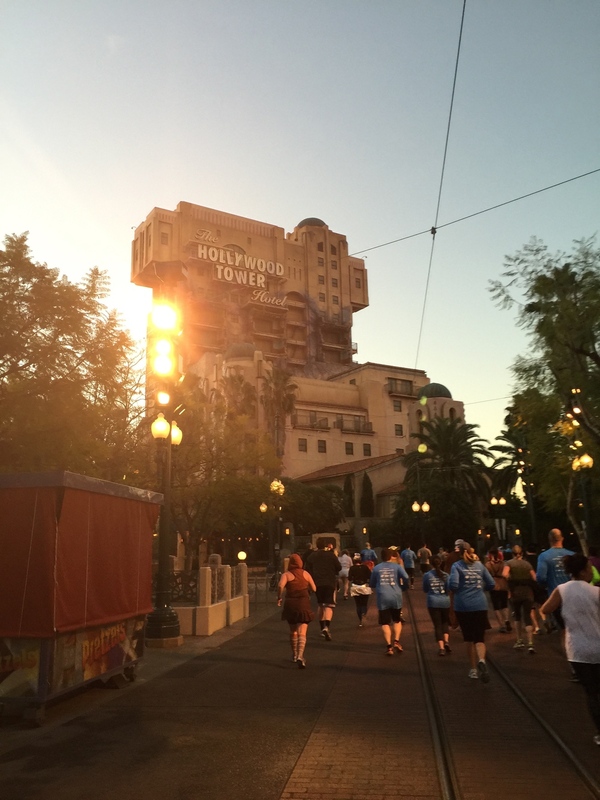 Have you participated in a runDisney race before? Share you're experience in the comments!